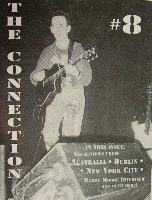 And welcome to the second issue of the Connection! Thanks to all who've joined since last time! To bring you up to date on what's going on with Luka, I'm happy to inform you that he's in the west coast of Ireland at the moment, writing the last few songs for the new album. He's got about 8 or 9 already finished. Some of those you might have heard either at his shows in California in mid-February, or the two East Coast shows he did in New Jersey and New York City (the latter two are reviewed in this issue). Included in his "acoustic motorbike" tour were "You", "The Wiping of Tears", "Exploring the Blue", "Mary Watches Everything" and "Bridge of Sorrows". Luka has done some basic demo recordings at Dublin's Windmill Lane Studios, but there's no official word on who'll be producing the album, or where it'll be recorded. The good news, though, is that the record is set for September release! Watch for touring information hopefully by the next issue. Those four American shows were completely sold out, with hundreds being turned away at the doors at the California shows. 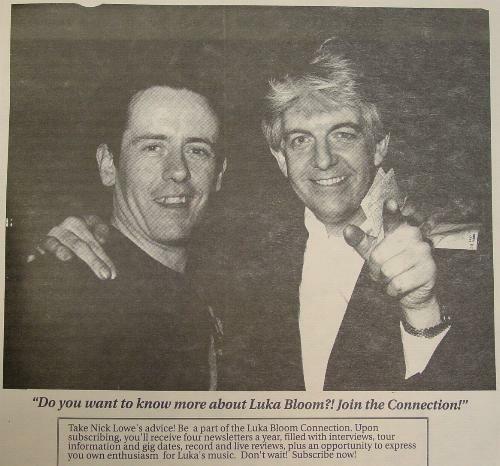 And by the time you read this, Luka would have just finished his gig on March 9th at Dublin's National Stadium, where he was An Emotional Fish's special guest. If any of you were at the show, feel free to to write a review and/or send photos to be put in the next issue. I've also read a review of Luka's one-off jaunt in Rennes, France, for their 12th annual Transmusical Festival this past December 7th, where one British journalist rated Luka's version of "I Need Love" as possibly THE moment of the festival! Remarkable when you consider that Luka only did a 50-minute set, and it was the first time he'd ever played in France! In between those few shows, and working on the next album, Luka's been nominated for quite a few awards. In Dublin's Hot Press Readers Choice Polls, Luka was voted 7th among top 10 Irish songwriters. Hot Press also holds their annual Smithwick's/Hot Press Music Critics Awards, and Luka was among the Best Songwriter nominees. In addition to that, here in America, he was nominated for a Grammy Award in the Best Folk Artist category. Luka in the movies?! No, but if you saw the recent film, The Field, starring Richard Harris, you'd be pleasantly surprised to hear "Black Is The Colour", a song Luka has performed on his "Riverside" tour last year, being sung by one of the actresses in the film. Luka has written songs inspired by films, you might be interested to know. One of them, an older song, called "The Way You Talk To Me", was inspired by the film Children of a Lesser God. And 1989's The Big Blue inspired Luka to compose "Exploring the Blue". I read recently that a film about the Guildford Four will be going into production soon, with Gabriel Byrne in one of the roles. Although not exclusively about Paul Hill, wouldn't it be fitting to have Luka's "This Is For Life" included in the film? Fans of Luka's brother, Christy Moore, will be delighted to learn that he'll be touring extensively this spring within the British Isles. It'll be starting off with 2 days in Scotland at Glasgow's Barrowlands on May 4 and 5, and ending June 2nd as part of the annual Fleadh at Finsbury Park near London, with gigs everywhere in between throughout May. Luka might even play this year at the 2-day festival. THIS JUST IN!! Latest news is that Luka will be one of the acts to be part of Ireland's annual Easter Folk Festival in Killarney, starting March 30th through April 1st. Also on the bill will be the Donegal-based traditional band, Altan, as well as Planxty's Liam O'Flynn, Maura O'Keefe, and the Texas Kelly's, among others. In the years since its inception, the Killarney/Carlsberg Easter Folk Festival has gone from strength to strength. Killarney is the place to be for anyone interested in traditional, folk and contemporary Irish music over the Easter weekend. If you plan on being there, plan on getting there early! Also, I've just learned that a special festival of music, comedy and entertainment called "Project 25: From Paddy's Day to April Fools" will be happening in Dublin's Project Theatre. On Tuesday, March 19th, Luka will be playing there as part of this wide-ranging event, with The Quacksquad as the support. There'll also be Irish set dancing classes, poetry reading and the like. Luka probably won't be back for a "proper" tour in the States until the new record is released, so the best place to catch him would be in Ireland this spring and summer, it looks like. I'll keep you posted on further tour/gig developments as I hear of them. Before I sign off, I'd like to take this opportunity to thank Glenn and Tom at Tomorrow Management, Tommy Sheridan, Kathy K., Paul F., Rick S. (for being so wonderful at the Tramps show!) and of course, a special thank you to Luka, for making this ALL worthwhile! I had an opportunity to speak with Luka before the show at Tramps this past February 19th. We spoke about a very specific subject, one that's particularly close to his heart...his guitars. JUNE: Could you tell us what kinds of guitars you have, and have had, and their names? LUKA: Okay. The first guitar that I ever had that I named was Walter. But I've had a good few guitars over the years that I never named. My sister got me my very first guitar, as a gift, when I was about 11 years old. Then my brother Christy bought me a guitar, an Ibanez, when I was about 14. And then, my next guitar was a Guild, a beautiful Guild, that I used on my first album. After that, I had a Gurian, which was an American guitar, made by a guy who specialized in furniture and "specialist" guitars. He went out of business, unfortunately. This guitar was the most beautiful guitar I've ever played, and it was stolen on me in Dublin. Then I had a Loudon, which is a Belfast-made guitar. And then I met Walter. Walter was my first guitar that I named. It was a blue Washburn. JUNE: Oh, and I always thought it was an Ovation. LUKA: No... I don't like Ovations... I played with Walter for about two years. Then, the next guitar was Molly. And Molly and Nora were the two guitars I used on Riverside. JUNE: What's happened to them since? LUKA: Nora was stolen somewhere between Switzerland and Toronto. JUNE: You never got her back? LUKA: No, I'm still waiting to get the money from TWA. Still without a trace. JUNE: Have you ever augmented, or added on to your guitars, or had any custom-made? LUKA: No, none of them are custom-made. I've never had a custom-built guitar. I just walk into a shop, pick up a guitar, and play it and love it and buy it... if I can afford it! JUNE: Do you have any 12-string guitars? Do you like them at all? LUKA: I like them, but I find it very hard to find a 12-string guitar that suits me because I find them difficult to play... and then, there's Rudy and Judy. Rudy and Judy are great! Rudy I'm still using now, non-stop for over a year... Judy, it's funny: they're the same kind of guitar except that one's black; one's white. But the black one's much better than the white one... it's really weird. JUNE: And I always thought you were fonder of Judy! LUKA: Yeah, I like Judy, but Rudy's got a better sound to it. Rudy and Judy are from Rudy's Guitar Store on 48th Street. Jefferson, which is an acoustic guitar that I bought just for playing for myself comes from the street near where my manager lives. Walter came from the guy who bought and financed Walter; my manager at that time, who earned his living working with a photographer named Walter Pfeiffer, who used to do old Irish postcards... then there's Woody. You haven't met Woody. Woody is a beautiful acoustic guitar just for acoustic stuff at home. And I've also bought, subsequently for the next album, two new guitars. One called Rose, and one called Morris, from an amazing guitar store in London called Rose Morris... Really beautiful guitars. And one of them is a bass guitar, an electro-acoustic bass. JUNE: That's going to sound lovely. LUKA: It's going to sound incredible, yeah... and that's all of my guitars. LUKA: Yeah, very minimal. It's really just chorus and graphic equalizer. That's all I use. JUNE: Any sort of echo unit? JUNE: But more for the vocals. LUKA: A bit on vocal, yeah... we're not really an effects outfit. JUNE: What about the strings? How often do you restring your guitars? JUNE: Yeah. I would think you'd have to! LUKA: Every performance, new strings. JUNE: I've always wanted to know what favorite song you like to play on guitar. What do you really personally enjoy playing? LUKA: From a guitar point of view? Well, I like different things for different reasons. I like "Gone To Pablo", even though it's really simple. I like it because the sound is just so gorgeous. It turns me on every time I hear it; every time I play those first chords. And "Dreams In America" has that effect on me as well. It's just a sound thing. A really low, soft of a droning bass. And I feel that it ... the fluidity of that, and the flow of the chords and the sound ... I think it's the best example of what I do; that makes what I do unique. But from the point of view of fun, I suppose the instrumental I play after "Gone To Pablo". JUNE: "Te Adoro". Yeah, I can see you really enjoy playing that. LUKA: But I try and change that in some tiny little way every time I do it. I never do it exactly the same way twice. Most people might not even notice the differences, but they're noticeable to me. It can just be a mood thing ... Again, I really like the guitar on "This Is For Life", because it's really full. It almost sounds orchestral. It's got this really low bottom ... and lows going up into highs ... Peter (Luka's sound engineer) describes my sound as being like velvet mixed with broken glass... And so the things I really get a kick out of, from a guitar point of view, tend to be more with the sound I get out of them than with the way I play, because I'm not actually all that good of a guitar player. JUNE: Oh, you're being quite humble there! (laughs) I strongly disagree! LUKA: (laughs) ... No, no ... I mean, if you were to talk to someone like Mark Knopfler or Eric Clapton, or John Williams, the classical guitarist ... I mean, what I do is sort of innovative, but it's really, from a technical point of view ... it's actually really simple. It's just the tunings and the sound that I get that make it sound so great. It sounds amazing! It sounds fantastic! I love the sound. I'm not just being stupidly humble. I know that it sounds great. But it's not complex. How I arrived at what I got was complex, in terms of making this sound and making this style ... that was complex. But it's all simple, really. JUNE: I've heard that you have this interesting way of tapering your strings. ...And the show, as one would expect, was nothing short of amazing. And not one string was broken, either! The following is an edited version of an interview Luka did with Earle Hitchner of WFDU-FM, a New Jersey university radio station, on December 3rd, back in 1988. Earle is well known as a college radio announcer and a music columnist for the Irish Voice, but more than that, for his great passion for Irish music, whether it be traditional or modern. We pick up the interview after Luka's just finished playing "Cold Comfort" in the studio. EARLE: It's a pleasure to have you here. I haven't seen you in about 2 years. I did see you at Tramps a while ago... This is delightful. EARLE: You've been described by some journalists as a new wave acoustic artist, and that's just vague enough to fit since it practically covers everything that's not electric. Obviously here you use a pickup on your acoustic guitar. Is that a term you feel comfortable with? 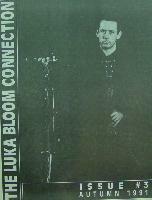 EARLE: Well, how would Luka Bloom describe Luka Bloom's music? LUKA: I suppose I'm most comfortable with the idea of being a contemporary songwriter. EARLE: Even the idea of a songwriter ... that you resist to a certain extent, too. Is that because it's too confining? LUKA: I do, because a singer-songwriter is something that I associate with something that came out of a folk vein, whereas the music that influences me tends to be much more rock music, contemporary rock music. EARLE: Give us some examples. LUKA: Well, the Waterboys or U2 ... bands like that. My influences come more from there. EARLE: But the Waterboys' last album is acoustic. Steve Wickham joined them. LUKA: That's a very interesting development. It's a very exciting development, which was bound to happen sooner or later. The fact that they recorded their album in Galway, with a bunch of traditional Galway musicians, which is marvellous, but still that is something which is a departure for them. It's not really where they come from, but then again maybe more of their music is going to start coming from there. I love to use folk music strains within my music, but the music that I write is geared much more towards a rock arena and a rock audience, and that's where I like to make that separation, or distinction. EARLE: Now you grew up in County Kildare, Newbridge, and for a while you also lived in Dublin, if I'm not mistaken, and then you resided for a time in Holland and a number of other places of course, and until recently, lived in Washington, DC. Now you live in Hoboken. You've been in the United States somewhat permanently over the past 2 years. Have you found living here, as opposed to living in Ireland, more beneficial for your music, or less? LUKA: Oh, absolutely, yeah! From the very beginning, when I started writing songs, my very first influences were American. For some reason, the very first day of starting to play music, I was drawn towards the guitar, and towards guitar players and towards songwriters then. And then I started writing songs when I was 14 or 15, and it was always American people who inspired me. Initially it was people like Doc Watson, who's such a beautiful guitar player and singer, and I used to listen to a bit of blues like Sonny Terry and Brownie McGee. And then I started to listen to songwriters like James Taylor and Cat Stevens, and so for me, to come to America was always a logical thing to do, but it took me a long time to get it together to come out here. I had a lot of stuff to sort out at home, and I spent a lof of time playing in Holland and Germany, and it was literally only 2 and a half years ago that the time was right for me to come to America. And when I think of it now, it was the first time that I actually picked the right time to do something. I came to America at a time when I was ready to come here, with a batch of songs that I loved, and I had a very clear idea of what I wanted to do and the kind of work that I wanted to do; the sort of places I wanted to play, and it's just been incredible since I've come out here ... I found a great warmth and I find American audiences very intelligent musically. I find them very demanding, musically, and I find it a very challenging country to be a performer in. And people just love songwriters over here. They really do, and I've been knocked out by the response that I've gotten. Particularly amongst audiences who haven't a clue who I am. Like I arrive in Cleveland or somewhere like that with the Pogues and they're there to hear the Pogues, or the Hothouse Flowers, and I'm just another support act, to open up the show. EARLE: That's a very tough thing to do. LUKA: Particularly with the Pogues it was tough. The first show with the Pogues in San Francisco in the Filmore West, which is a very, very big room for me to start in. EARLE: And it has a lot of history, too. LUKA: A lot of history. And you walk out on that stage and you can sort of see the spot where Jimi Hendrix threw up on. (laughs) It's an unbelievable experience. EARLE: (laughing) Hopefully they've cleaned it up since then! LUKA: But there's this marvelous sense of history in the room, musical history ... so many incredible people have played there. You can really feel that when you walk out on that stage. And there's this audience of people who want to slam dance to the Pogues. But at the end of every single show that I've done, I got a sense of people wanting to discover me and to get closer to my songs and people wanting to find out about records and just a really genuine interest in what I'm doing. And going back then a second time to these places with the Hothouse Flowers, there were people who had seen me with the Pogues and were coming back again to hear more. And so there's a real sense of literally being discovered in America, with no record company hype, no big promotion ... just arriving into these big cities as a total stranger, singing these new songs and people warming to it. It's been a great experience for me. EARLE: Did you find that the audiences were similar? When you toured with the Pogues - and they've been described as an Irish punk rock band. Shane MacGowan, by the way, disavows that particular kind of label. I've seen a couple of interviews he's done in Hot Press and he's not happy at all with that label of punk music. He said, "We're just playing music. You make up your own mind." I think in that respect he shares your opinion of approaching labels and pigeon-holing. But does opening for the Pogues ... is the audience you're drawing there the same audience you're drawing for the Hothouse Flowers, even In Tua Nua? LUKA: No. To a certain extent, there would be a sort of crossover, but the manner in which these two bands came to America were very different, and so the audience is different. I mean, the Pogues, from what I can gather, this is their fourth tour. They sort of came into America via the college stations, and so they've built up a very strong underground following which still has stuck with them. They tend to be a more young, very sort of wired-up, lively audience, a fantastic audience to play to, and a very loyal Pogues audience. Whereas with the Hothouse Flowers, this is their first tour, and it was a very, very big, adventurous tour for them. They came in through MTV. They came in through enormous record company backing from the word go. EARLE: Did you find that all the hype that attended that particular tour was a little daunting for you? A little tough to handle? LUKA: None of it was daunting to me because none of it was at my expense (laughs). So I mean, it was very interesting. I was sort of on the tour, very much as an observer. It was a very interesting education for me... to compare different scenes that go on. It was very interesting to watch hype in action from a ringside seat. It was very interesting to watch how major record companies behaved themselves out around the country. And it was also a very interesting experience for me to learn from, with regard to my own future in America. To be honest about it, I'm really glad I've come to America as an unknown, and built up a following for myself; a very small grassrouts following around. In 6 months I've played in 28 cities twice to 48,000 people without ever having to worry about the promotion or publicity, and it's wonderful. LUKA: It's a great feeling. EARLE: You've gotten some excellent attention from people like Brendan Shorthall and a number of other critics have drawn to your music, and they in turn have drawn in a few record companies, I suspect, and they're coming out to see your gigs. The thing I wanted to ask you concerning Shorthall, and this has cropped us twice now in the Irish papers, is he was beginning to wonder if you were going to become sort of a permanent opening act or second bill kind of performer because you opened for Hothouse Flowers, In Tua Nua, the Pogues, and now you're going to open for the McGarrigles. Is that something that you're laboring under, to a certain extent? LUKA: No. This is all literally within the last 6 months. I came out here with no record deal, as I say, and built up a small following for myself in Washington and in New York and in Boston, doing certain clubs. But as somebody without a major record deal, there is only so much you can do, and I deliberately decided on a strategy when I came out here of building a live audience as opposed to spending my time flying around record companies in New York with tapes. I decided not to do that; to concentrate on an audience, and here, in the space of six months, I was presented with two wonderful opportunities to play to a considerable body of people right around the USA and Canada, and I jumped on it. It was absolutely the right thing to do. I'm going to start to build my own future out of that. EARLE: So you're taking a different direction. Most artists will make a demo, shop it and then look for record company support and then play venues. You're playing venues and developing a popular support, and then hoping to get attention, obviously. LUKA: In the last two or three shows that I've performed in New York, I think in the region of eight major record companies have come to see me. And none of those ever received a tape. They've only come to see me because of the word of mouth about the live performances, and that was a deliberate decision on my part, because I believed that the live performance that I'm doing will eventually be what will get me the record deal that I want to get, and one that I want to work on. I'm not in any big hurry to headline in the places that I would like to headline. I ultimately see myself as somebody who will want to play in and headline in the venues that I've opened for people in, but that's gonna take some time. It's going to take a lot of work. It's not something that I even want to happen overnight, because in order for it to happen overnight it means generating a very artificial sort of hype that I don't believe is appropriate to what I do, and so I want to be a grandual buildup. EARLE: If you see yourself playing in the same venues for which you opened on these national tours, do you see yourself with a band? Because you have played with Red Square in the past, a rock band. You've obviously played in folk bands. Do you see yourself, not now maybe, but down the line, playing in some place like Madison Square Garden, do you see yourself playing with a band behind you? Earle, one of the things I've noticed coming out here is that in the last year and a half that there used to be a time where if I wanted to play to an Irish audience, I'd go to Galway or Sligo or Castlebar or Cork or Belfast. But now if I want to play to an Irish audience, particularly younger Irish audience, I've got to go to New York, Boston or Chicago or San Francisco, because so many of the people of my age group, even a lot younger, have come out here, many of them with degrees and with a lot of talent, a lot of skills... It amazes me wherever I go the numbers of people I meet ... guys I went to school with ... and many of them are people having a great time and are really happy and they like it here. But I also meet a lot of young Irish people out here who are very bitter, because they really want to be at home, and they would like to work their skills at home in Ireland, but they feel that've more or less been encouraged by the Irish government to get out, as a solution to the unemployment problem in Ireland. I meet a lot of those people. And early on this year, I wrote a song which I tried to gear deliberately towards to the young, bitter people in New York and in Woodside, or wherever they are, who feel that they've been cheated by their own people, by their own government and... This is a song called "100,000". LUKA: (after playing "100,000", laughs, and asks Earle jokingly) That answered one of your more awkward questions for you, did it? EARLE: You did. (laughing) You saved me about 10 minutes of awkward sitting here! I'm going to take you back now. You're going to be surprised at some of the sources... You gave a Hot Press interview some time ago, with Kate Shanahan. Now I don't know if you remember this one. In that you said, "You know I spent years and years writing songs about political situations and turmoil and social disease. A lot of the songs were good. But I think a lot of the time I just wanted to deflect away from the stuff that was going on inside of me, that I was afraid of." And a little later in the interview you said, "I began to realize that I was being carried along by tides, because it was easier to be carried along." Do you still feel that way? LUKA: No, I don't feel that way now. It's interesting to hear that repeated back to me. It's about 3 or 4 years ago since I did that interview, but it still holds true to me. The time when I was very, very involved in a couple of things, politically in Ireland, at a time when I was very insecure myself and very unsure of a lot of things about myself, and when I was trying to figure out what I wanted to do with my life and even what the hell it was I believed in, and trying to understand. And in Ireland, that's always a very difficult thing to do. I found myself being drawn along into things, drawn closer to things that I wasn't even all that sure about. To be specific about it, I was very involved in the anti-nuclear movement in the middle 70s. EARLE: He's back in Ireland now. LUKA: He's gone back to Ireland, yeah, but he'd been in LA for the last 8 years. But we did the very first anti-nuclear tour. We just went around colleges, universities, trying to inform people about as much as we knew, about what nuclear energy would mean to Ireland, and what we knew little enough of. It was a very strange time. And I was very interested. Our family's always been a very political sort of family. My mother was very political, and that was a very emotional time. And for obvious other reasons, there's been a lot of major problems in Ireland since the late 60's, particularly that everybody's been involved in, in one way or another, and everybody's been affected by. Around the time of the hunger strikes in Ireland, 1980, I was at a time when I was very, like everybody else in the country, just drawn right into it, into wishing that this thing could be sorted out and realizing that you're dealing with somebody in the form of Magaret Thatcher, who was not really interested in helping us to find a way to sort it out. And so there was a lot of frustration, a lot of pain, a lot of anger on the part of a lot of people. And I was very drawn to that, and I'm glad I was. EARLE: Did that give rise to "Remember the Brave Ones?" LUKA: No. "Remember the Brave Ones" is a song I wrote after I read a book called Dispatches. That was written by a man called Michael Hare. And that book was based on his journals that he wrote in Vietnam, and that particular song was written because one of the things that he said when he came back from Vietnam was the reason there was so much war in the world was because there were enough men in the world who liked it. And that idea horrified me so much, that that's what basically inspired me to write the song. That people focus so much attention on, if you like, hero worship of people who died in wars, that very often, that becomes more important than the devastation that can take place in wars. And that's really what that song was about. This was really something a bit different. This was a very personal struggle for me, because I grew up in a very sheltered, safe environment in the sense that we were never really affected by the problems in Northern Ireland as children grewing up in Newbridge, County Kildare. It's sort of a garrison town, and it was a very ordinary, quiet, safe, middle-class thing. And then in the early to middle 70's, you find the whole country being thrown into this state of just ... turmoil ... trying to understand it and figure it out, and I just found myself being more and more drawn towards something I wasn't really sure about. I stopped in mid-flight. I asked myself, where do I really belong here? And I actually had to pull back from it. I was in a stage in my life where I needed to pull back from just about everything, politically, for a while, and try to figure out where I stand, and what I believe in. And I'm still doing it... I'm still trying to figure it out... And it's something that I try to be very sensitive about and careful about because there are so many lives at stake. And there's a whole country at stake. And it's something that really bothers me; it really troubles me, because I find it very hard to come out and say, "Well, I think these guys are right, or these guys are right..."
EARLE: Do those kind of issues and causes still motivate your songwriting, or do you find now that your more recent songs have been sort of categorized as personal and self-examining songs? LUKA: No, not really. My songs are, to me, political in the sense that if I do write political songs, they're only generally inspired by the experiences of individuals. I try to focus more on people than on ideologies. I'm not motivated to write songs by ideology. I think that's something which I feel that if I wanted to go into politics to change the world I'd use the political arena. Primarly I see myself as somebody who basically writes about my own life's experience. I don't feel qualified enough to tell people what they ought to think, or to point people towards a specific ideology, or to support this movement or that movement, because there might be aspects of that movement that might be repulsive to me, whatever movement that might be. And in that respect, I'm not a political songwriter. But when I come across something where somebody obviously has been seriously affected by a political system or somebody's freedom has been infringed upon by a political system or by an injustice ... I have to write about that, because that's something that affects me, and my everyday life. It's something that threatens me personally, and all of us personally, and for me to ignore that and to just write songs about my own petty little experiences because I''m afraid to say what I feel about this person, I'd be running away from my own sense of values. I try to be honest with myself, but at the same time, I have to be careful about it, because I'm not a member of a any political organization. Nor do I want to be. I don't see that as a cop-out. I see that as a responsible decision on my part. I like to think that being free of any involvement with any political organization, I can observe what I observe, and to write about that. And that's what I see as my role as a songwriter. There are singers who are more politically defined than I am, and I will readily admit to that, I'm probably maybe a bit too selfish, I don't see myself who is politically motivated in the organizational sense. EARLE: (after Luka finishes performing "This Is For Life" as an example of what he was just discussing with Earle) While we're on this subject of songwriting, I'm going to ask you about a song of yours, "The City of Chicago". Deep in the recesses of your mind, if you remember, "The City of Chicago", a song that you wrote, is featured in a chapter on Irish emigration in the Irish national school history books! LUKA: Yeah. I only heard about that a little while ago. EARLE: When you found out about that, how did you react? LUKA: Totally knocked out. I mean, it's wonderful. It's unbelievable to sort of feel that in some way you're sort of helping to shape the minds... contributing to the future's perception of Irish immigration. It's weird. The weird thing about that song is that I toil over songs. Sometimes songs can take me days and days and weeks and weeks sometimes to finish, and sometimes songs evolve over a period of a year. But I write "The City of Chicago" in about 15 minutes! EARLE: Had you visited Chicago before, when you wrote the song? EARLE: Uh oh, all thes little illusions are now going to be completely dispelled! LUKA: Well, one of my brothers, Andy, had decided a couple of years ago, to travel with his wife and two children to America, and to spend some time living there. The night before they flew out, or close to that time, they came to stay with me in Dublin. This would've been about '82, I think. And we went out, and it was a very emotional evening, because we're very close, obviously. It was the first experience we'd had in our family, of anybody leaving the country for any length of time to go and live away from home. And when they left, I just sat down and started to think in a very raw, real way, of what it must've been like in 1846 and 1847, when so many people left Ireland and they knew they were never coming back ... that's if they even survived the journey; because a million of them died on the way, on the boats. And so I tried to get inside that feeling, and I tried to write as simple, as direct a song as I could, and I wanted to give it the name of an American city, and I just picked the city of Chicago. There was no other reason. I thought about the city of New York, the city of San Francisco ... the city of Chicago just felt right. There you have it. That's the song. EARLE: And you literally made history books, at this point. EARLE: Let me ask you another question. Why do you call your guitar Molly? I know BB King calls his Lucille, but why do you call yours Molly? EARLE: Oh, okay... we're continuing on the theme. My wife speculated on the Bloom part... is it Leopold? Or is it Molly? LUKA: Well, if Molly's the guitar, I've gotta be Leopold! (both laugh)... It's all totally pretentious. But it's good fun. 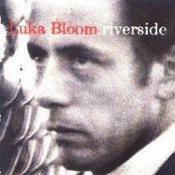 BP Fallons listens to Riverside and talks to its creator, Luka Bloom. This is a reprint of the article that appeared in Dublin's Sunday Tribune, February 4, 1990. The release yesterday in New York of my record was, he says, "like the birth of a child". 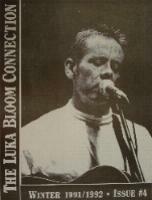 Luka Bloom is dressed in black Levis, talking a million miles an hour. This is the man who went over to the United States two years ago with just $200, "my arse hanging out of my trousers, no manager, no agent, but what I dreamed as a 15-year-old boy had come true. And the reason it happened is because, I'm a dreamer. I held onto my dreams." "Whatever it is that made me run out at the end of class at Newbridge, run up three flights of stairs, play my guitar in among the suitcases in the luggage room for four minutes, then run back down for the next class ... and spend the next hour thinking about what I'd played." 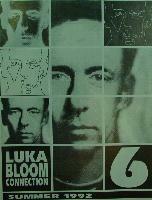 The enthusiasm and excitement comes from the release of Riverside by Luka Bloom. A man and his acoustic guitar, it's a work of burning urgency bathed in a passion of intent. Luka's on the runway, the engines are revving and he's taking off. "Politics should not be the art of the possible, it ought to be the art of the impossible." Luka quotes Havel, the new head honcho in Czechoslovakia and then he laughs, a big rattle of a laugh that forever punctuates his conversation. A generous helping of happiness punctuates Luka's LP, songs like 'Delirious', 'Over The Moon', and 'You Couldn't Have Come At A Better Time'. "The lyrics are pretty direct. There's nothing mysterious about it", he says. This man is madly, wonderfully in love with life. It's contagious. 'Dreams In America', a panoramic wash of reflections, was inspired by a sunrise in New Mexiko. "When I was on tour with The Hothouse Flowers, driving from Amarillo, Texas to Vancouver, 1,850 miles between two gigs, showband vibe, driving between the Rockies, and I got this great sense of the sheer beauty and vast expanse that this is America." Luka says he had to go to America. "In Ireland, I was still Barry Moore, the guy who had been about town in Dublin and Germany, struggling in his brother's shadow, getting nowhere." 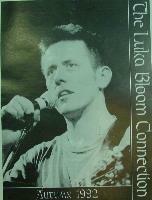 These days, his brother Christy goes on the radio and proudly says "1990 is going to be the year of Luka Bloom." "It's had a major psychological effect on me, changing my name", Luka says. So you're sort of born again? "Not so much born again as reincarnated." In New York, the new boy in town wasn't weighed down with any historical appendages. 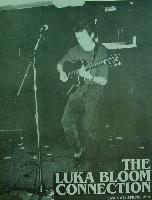 And when the record companies started taking an interest, he refused to send them demos, didn't want "to be put into a Suzanne Vega, Tracy Chapman, Michelle Shocked bag with someone saying 'It needs a fretless bass...'"
On the LP, Luka's acoustic guitar is at times delicate, at others forcefully powerful, like a steamrolller on amphetamines. And colours are brushed through the mix by the fiddle of Eileen Ivers, the mandolin of David Mansfield, the cello of Jane Scarpantoni, the flute of Conor Byrne, the bodhran of Liam O'Maonlai from the Hothouse Flowers. But in the heel of the hunt it's the songs and the sense of realness from the voice that propels this work. "My mother always talks about not wasting oxygen, about being useful," Luka reflects. "I always felt if I could do anything useful it would be to give people songs, add my songs into the stew..."
The pot is bubbling. As you prepare to leave your host's house, the phone rings. Someone's talking about the forthcoming review in America's Rolling Stone magazine. "They've given the album four stars out of five", Luka reports, a grin as wide as the Hudson River on his face. "Now that's not bad, is it?"